Today I want to share with you my latest Instagram photos, but if you want to get my photo updates sooner you can follow me HERE. Because lately I have been using a lot & I love seeing other people pictures as well! Anyways, today I have to work (I have been working for 9 days with only one holiday! So hard & tiring! ), but as of tomorrow I will have 3 holidays! Awesome! & I am going to spend them at my countryside with my family! Mostly because tomorrow it’s Midsummer & we always celebrate it together! So as I will not have a chance to congratulate you all tomorrow- Happy Midsummer! Do you celebrate it in your country? Because in Latvia it is almost the biggest event of the year! as jumping over the bonfire, singing Latvian folk songs, women wear flower wreaths, men wear oak tree leaves wreaths! 6. & 7. My little doodle Fleur & her sleeping poses! I love my cat and she makes me laugh every day! 8. I went to an H&M Latvia (Alfa) staff party & I had so, so much fun! I have the best colleagues and we definitely are like one team! If you want you can follow my Instagram account HERE! do you want to follow each other? let me know . definitely following you on insta : ), such a cool job!we don't celebrate here in India but sounds like a fun holiday..have good times dear and may we invite you to our Firmoo Giveaway? I love the blouse in the second photo! I didn't know you work at H&M! So nice that you work at H&M, I used to buy a lot of clothes from there. Now I'm on a forever 21 kick though hehe 🙂 Enjoy your holiday! Great photos hun, your cat is soooo cute! Insta-great, love your instapics girl, you know it. Lovely pics, your outfit in the last picture looks gorgoues! That's so neat to know. We don't celebrate midsummer like that here in the US. But I like to celebrate the start of summer by shopping for shorts and sandals! Lol. Love your style pics. Have fun!! Yes, we celebtrate it in Spain but we call it "San Juan". It's very similar, we light bonfires and jump over them and eat and drink the whole night, it's super fun!! lovely photos! your cat is so cute! Perfect post, love this moments!! I love your pictures ! Especially the drawing ! Aww look at your kitty! So cute. Love that sparkly skirt!! Such cute photos! Great post! Lovely pictures dear!! The skirt in the last one is fantastic! Your cat is so damn pretty!!! Good! What's a sales advisor position? 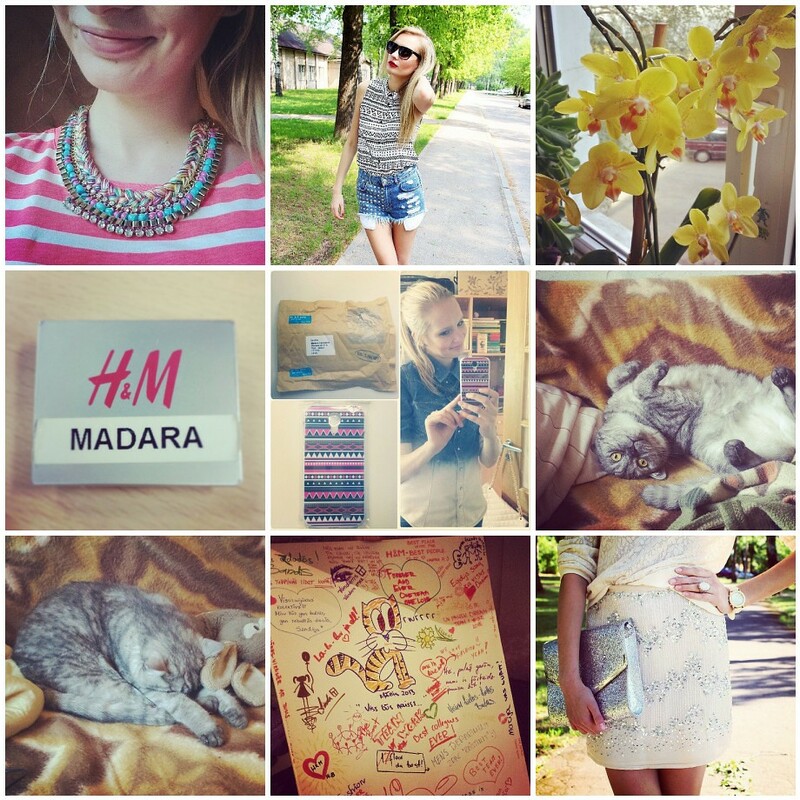 Great photos; your next outfit post looks very promising! Love the necklace on the first photo! Can't believe it's H&M! Gorgeous darling, enjoy your break! I love these photos! Such a cute cat! Hi! in Spain celebrate the night of San Juan (the night of 23 to 24 June) on the beach, with bonfires too. A wonderful roundup of pictures hun…Hope you have a positive and productive week ahead! I wish we had that tradition in the states. It sounds like so much fun and who would't want to celebrate mid-summer?! love the sequined skirt in the last pic! I love the h&m necklace, it's so cute! Ahh your cat, so cute!